It’s been twenty years and the Podracing scene from The Phantom Menace still haunts my dreams. I got the Lego kit of Anakin’s pod for Christmas that year, and added parts from my box of random Lego bricks to make it bigger and faster and better. I’d love it if podracers became scientifically possible. The best part of the whole racing sequence is the audio production. According to StarWars.com, they synthesized the pod sounds from real cars. 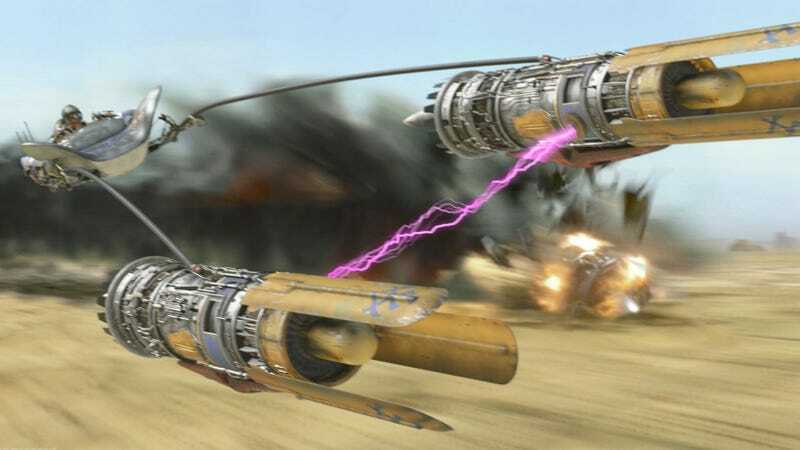 The roaring sound of cars speeding around a race track is memorable, and it’s the same with podracers. The variety of noises present in the podrace is staggering; they immerse you in the event. The sounds of the engines throughout the race particularly stand out. Each vehicle was different because Burtt gave each of them a personality. His team used the sound of actual engines from cars such as Porches and Mustangs and tools such as the Kyma (a sound synthesizer) and wave-table chopper to make the podracers come to life. If you could use a pair of turbojet engines to build your own pod racer, surely one of us would have done it by now, right? A guy can dream. Anyway, congratulations Yes I drive a 240... Sort of for your COTD victory today. I need more references to one of the best Star Wars scenes of all time in my daily life. Hopefully one day your dream will become reality.